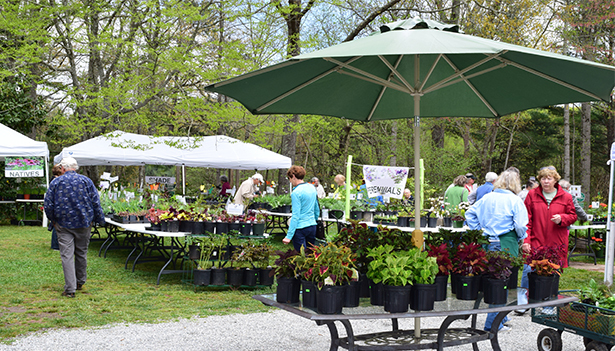 Bullington Gardens, a horticultural education center and public botanical garden, will hold its annual spring plant sale on three days, Thursday, Friday and Saturday, April 25, 26 and 27, from 9 a.m. to 4 p.m. each day. The event has been extended a third day to better accommodate customers. The sale will feature a wide variety of native and non-native perennials, more than 20 varieties of tomatoes plus other vegetable starts, herbs, unusual annuals, and small trees and shrubs. Back by popular demand are the Pollinator Packs, a collection of native plant seedlings nurtured from seed at Bullington Gardens. These “Instant Pollinator Gardens” include three plugs each of four native plants chosen specifically for the Western North Carolina habitat. This year, customers can choose specific plant plugs to customize their Pollinator Packs. Information sheets about the plants are provided. Extension Master Gardeners will be on hand to answer questions. Growing plants and maintaining Bullington’s 12 acres of gardens and grounds is managed by a team of almost 90 volunteers. “We call this special place a ‘garden with a heart’,” says Joellen Johnson, volunteer coordinator. Bullington Gardens is located at 95 Upper Red Oak Trail in Hendersonville. For more information, call Bullington Gardens at 828-698-6104 or visit bullingtongardens.org.